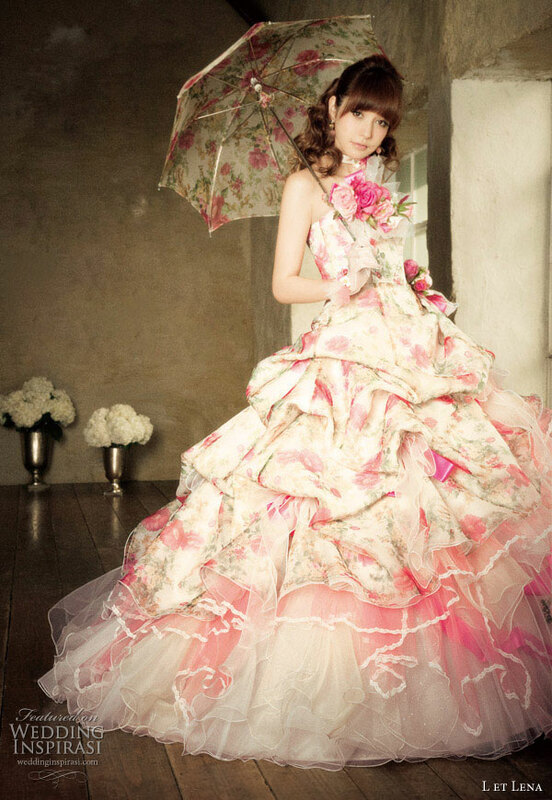 Japanese fashion model, singer, and actress Lena Fujii (藤井リナ) presents L et Lena, a collection of colorful, romantic wedding gowns. Fujii, who is a regular face on Japanese fashion magazines such as ViVi and sweet, was involved in the design process. She also models all the gowns, and she sure nailed the Romantic Princess look. This ruffle mermaid dress with sweetheart neckline is gorgeous and so is the veiled parasol. Pretty rosettes on a dusty pink/purple ball gown with matching gloves. A dazzling train. In her element - modeling a cute, pink ball gown with pickup skirt. Adorable satin lined brolly. Lavender ball gown with tulle overlay.